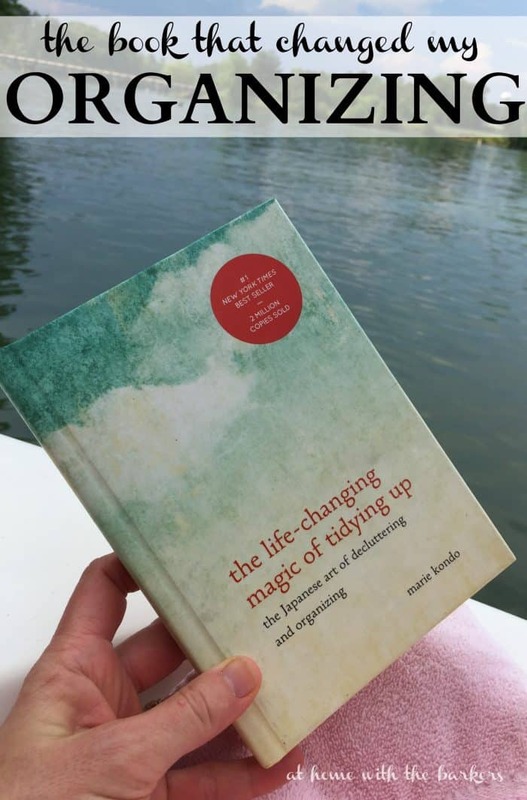 Y’all, this book, the life-changing magic of tidying up, is life changing just as it says! I don’t usually see myself as one of those pack rat, keep everything type people but I do have lots of STUFF! Stuff that does not bring me or any member of my household any joy. I asked for this book for Mother’s Day and started reading it that very day at the lake. The entire premise of Marie Kondo’s way of thinking is spot on for me! I now know that I have been doing any organizing and purging wrong my entire life. It’s as if the biggest light bulb was turned on inside my head. The Kon Marie Method, Organizing and Tidying, is a way of purging and organizing by category. Not one room at a time, little by little but full on Go For It! I have personally never done well with one room at a time because I am one of those all or nothing type personalities. Also, I have a tendency to store things of the same category in lots of different places. For instance, I have tools in almost every room of my house yet I can never find a flat head screw driver the moment I need one. Crazy right?! So you start with the least personal items because it will go faster. If I start with sentimental items I’ll never get anything done. Starting with clothing is the recommended first category. PERFECT! I have lots of clothes that needed to go. So did both of my children. Even after I sold some items of my daughters to a few friends, made a big bag for my nephew and separated a big stack for my mom, all of this was left for donation. Then I pulled together in my dining room all of my decorating items, thrift store finds, etc. After you have everything from one category all in ONE place you ask yourself, “does this bring me joy?” You have to ask yourself this question about every item. When you think about the word JOY and what really does evoke joy in your heart, stuff…items…things…don’t bring joy. Time with my family and friends doing the things we love is what brings me the greatest joy and when I spend 30 minutes looking for something or deciding what outfit to wear, that’s 30 minutes less I get to have with my family! SO, through out the summer I will keep you updated on how the Konmari Method is going around here. My husband is really excited about what I have accomplished and he is ready to tackle all the tools! AND we have LOTS of tools! **UPDATE: The shed was a mess! 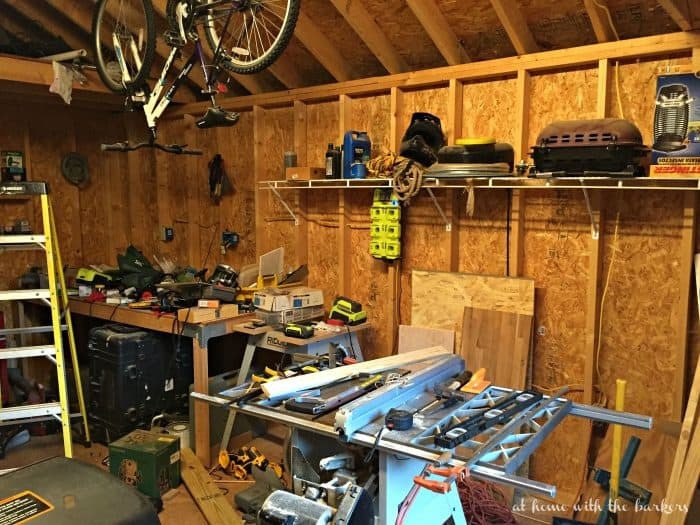 You have to see the Shed Makeover! I’d love to hear from any of you that have read the book and started on the konmari method? If you haven’t yet here is my affiliate link to buy the book right now! 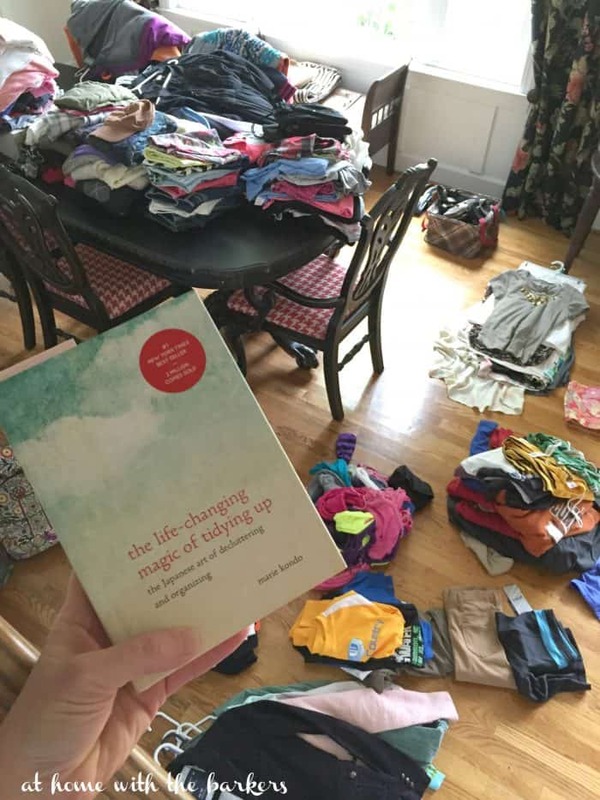 The Konmari Method, Organizing and Tidying the life changing magic of tidying up. It’s interesting where I keep finding things Melissa and once it is all in one place it is so much easier to see. It feels good! It sounds like you are well on your way to getting declutter. I think with your injury especially, this will do wonders. I’d love an update on your downsize. That is a big leap but an exciting one. We are getting close to the downsize days and I don’t want to be overwhelmed when time comes. As I did the biggest purge of my life recently I knew that though purging part was very tough emotionally, that afterwards I would be okay. And I am fine. Everything that is most fundamental about me and my family is intact. I am excited to do a more little tweaking to be completely free of any extra clutter. I find that it is a process. I am on my third sweep since the beginning of spring… I also wonder what this will mean for the value of things for me in the future! It really does change your perspective about what you keep! Interesting book. Yes keeping things of one category in one place is a good idea, its terrible when we have to search for it as we search for it only when we urgently need it and that time not finding the iteam can be frustrating. Your right about joy, iteams don’t give direct joy, just we like something because its a reflection of us. For instance I love my smiley emblem necklace and like wearing it, I feel different with it, or when I buy a key chain of my favorite personality I like it, it gives positive vibes. Anyway, good luck learning new insights from that book on organizing and de cluttering. Another blogger mentioned the book taught her to be grateful for what she has, for ex, the wallet has severed you and you must feel grateful for it etc. So true, the less stuff your have the more you are grateful for the items you decided to keep! Much more special! Sonya, I love that you are referencing this book. At Christmas when my middle daughter was home from college we saw this book at Barnes and Noble and picked up 2 copies because just reading a little bit in the store we were very intrigued by it. She read hers as soon as she got back to school and purged unnecessary items she had at school. It took me a few months before I had time to read the book (it is a quick read) but after that I really started in with the small stuff first like she said. Went through the bathroom cupboards got rid of extra shampoos and body washes and all that girly stuff that when you have 3 daughters you start to collect. Old makeup, shoes, socks, undergarments, books etc. and boy did it make me feel good. Then moved into the kitchen, got rid of old tupperware, corning ware and other unnecessary items and it was nice to have all of the extra space. 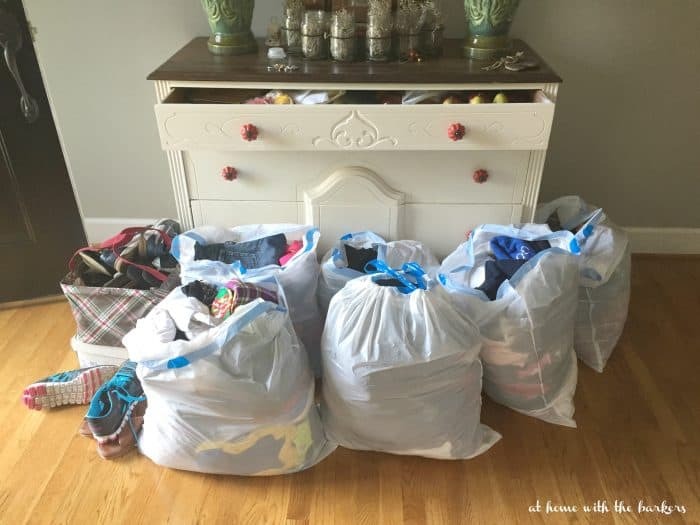 There were items that I had not used in years and because I received things as wedding gifts there was an emotional attachment but once I let go and carried the bags off to the thrift store I felt so much better. I need to get back to my purging again though, still have other categories I need to work on. Did break the rule of the book a bit by starting to do my tidying without reading the entire book! Oops! I work at a school so will have some time off during the summer, so I am hoping to get back to my tidying in a few weeks, as well as starting my bedroom makeover with the cool headboard you have on your blog a few month ago! Thanks for always posting such great ideas! Happy Friday! It really does make a difference when you base your decisions on how joyful the items are to you now.Sounds like you are on your way to an organized house. I am still working but feels really good! I have been wanting to read this. 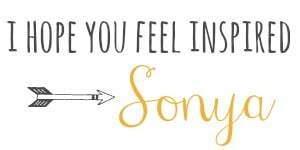 Thanks for the inspiration Sonya! This is great! I moved abroad a few years ago with just three suitcases but have collected too much stuff again. Time to ask, “Does this bring me joy?” Thanks for sharing! I’m about 1/2 way through reading this book; everytime I pick it up I actually feel calm & capable of following her way. I haven’t started acting on anything yet but have found that when I’m cleaning, dusting, doing laundry, etc. that I ask myself “does this bring me joy? or a smile to my face?” When the answer is no, I get rid of it. My house feels bigger already! I’m just like you…I couldn’t wait to get started so I jumped in before I finished the book! Keep me posted on how you do! My advice is to keep the things you love not because someone else loved them once or because you think you should only because you love them. What works best for me is to give things away to someone who will love them like they should be. For instance, I have always given my best kids clothes to the school counselor because they always have children in the school who really needs them. For home items I offer them to a friend or family member who I know would love them. There are also times when you can sell and make a little money. DO NOT hold onto things too long after you have decided to get rid of them though, they will end up right back where they were and you will have accomplished nothing. Caught this link from your”Focus” post – and so glad I clicked. The book sounds awesome. I need all of the help I can get! Can’t wait to check it out. YAY, I am glad you clicked over and found something inspiring! I keep a tall round wicker basket tucked into a corner in my extra bedroom. Every time I have something that needs to “go away”, I put it in the basket right then. Every couple months (way more often during holidays/birthdays, I have 4 kids) I give it all away on freecycle. The day it’s being picked up I do a whole house purge- I move from room to room going through every single thing – and add all that to the stuff leaving. I bag it all in black bags or boxes and put it on my front porch. That way no kids/husband can go through it, and it’s not in my way. The person I choose to pick it up just grabs it off the porch and then it’s gone. It really works. (Freecycle is a yahoo group that’s in most cities and surrounding areas. If it’s not in your area posting to craigslist can work in the same way).